The XVIth Warrior Blog: The 3rd Annual XVIth Warrior Quiz Night! The 3rd Annual XVIth Warrior Quiz Night! 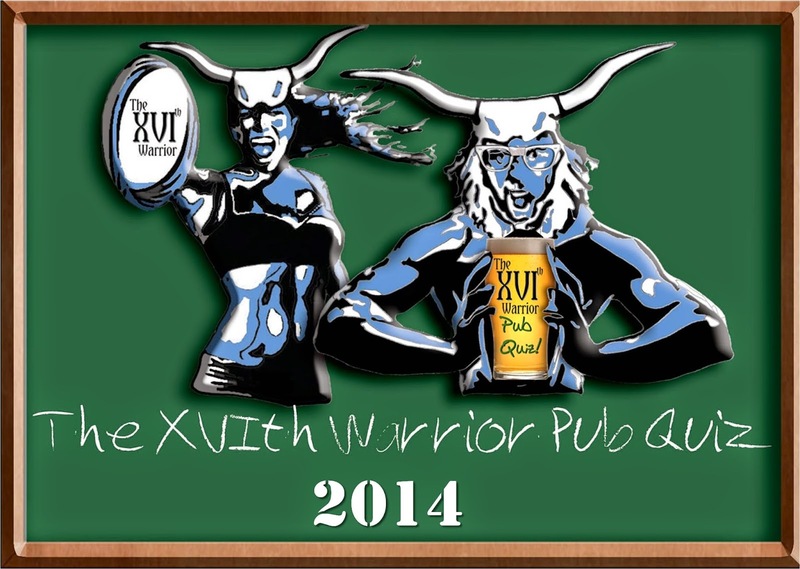 The Third Annual XVIth Warrior Quiz Night will be on 11th November 2014 at Waxy O'Connors!!!!!!! The entry fee will be £4 per person for members and £5 per person for non members on the night but, if you have pre-booked, the fee will be £3 for members and £4 for non members. The XVIth Warrior quiz night is a charity event (Movember being one of the charities who will receive a donation) with players from the Warriors also participating. We anticipate that teams will consist of roughly four to six per team and hope that we can arrange for at least one player to join each team. Although there will be a prize at the end of the quiz, it is intended to be a light hearted affair and the questions will mirror that with a variety of sections across the board. Individuals can book as you do not have to have a team before the night. If you have a team already primed, then all the better. The night gives our supporters the chance to mingle, interact, chat, have photos taken with the players and be amazed at their knowledge. Security and safety of the players will be on the Committee Members, so be nice! Our good pals at Waxy's will be continuing with their great hospitality and will supply some small bites during the interval. We hope to have a big turn out this year for what is a pretty good night, even though we say so ourselves, so please take advantage of the early bird offer and get in there quick!